The two DVD's describing "Netting Scotland's King of Fish" chronicle the many facets associated with the story of the wild salmon netting industry that once thrived all along Scottish coast and in many rivers. Topics covered include: the right to fish for salmon in Scotland; net construction; preparing salmon for the market; telling the age of a salmon. 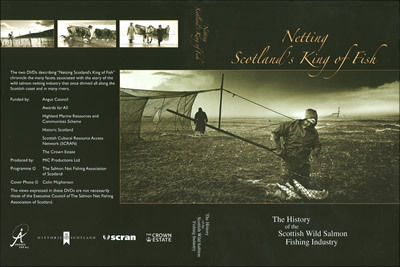 The DVD also provides an insight into the life history of the fish around which the industry was built and the many generations of netsmen who prospered from it.